“Oh just live with it”, she snapped. “Back Pain, it’s the McKay curse”, he mumbled. And I wondered why, yet again. I heard this many times while growing up but could not figure out what the McKay Curse was. But then, in my late teens, I noticed it in my own back. I fancied myself a runner, but after only a mile or so, I had to lie down to recover from my own aching back. Not so cool when you’re 19 years old. Most people are not like me. Even though stats say 80% of adults will experience significant back pain some time in their adulthood, most people will never need surgery. I was born with a birth defect where the facets in my lower lumbar did not develop properly in the first place. It was only a matter of time when surgery was going to be necessary. I’m not a victim. What has saved me from additional surgeries was developing a self-care strategy – a combination of effective exercise and effective rest and recovery. 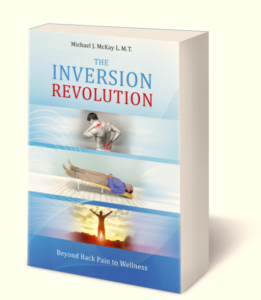 When facing back pain we need both an exercise strategy and a rest strategy and we should talk about them both. If you have back pain, doctors will tell you to rest and, when you feel able, to then engage in modest exercise. I am convinced that even a little bit of exercise can help back pain. My observation is that most folks recover from moderate or intermittent back pain within a few days or weeks using modest exercise. The best exercise? The real answer is the one that your body can tolerate and that you will take the time and do. Just simple walking can be excellent. Get out there! Just do something – so many things can help! Even a little bit can make a difference; a five minute walk, a few minute swim, some light stretching, yoga or Pilates. Find what you like but more important what your body likes. Mix it up. Try different things! I do a lot of different things. My favorite is light bouldering, which is like rock climbing except you do it sideways along a wall – no ropes and no falling. It engages my core (very important for back support) and gives my back a stretch at the same time. 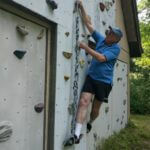 Plus, because it is on my barn, it takes very little time; usually I’m on the wall 5 minutes and then resting for a few and then another 5 minutes of bouldering – and then I’m done. And it is fun; its amazing how good even a few minutes contributes….and it adds up too! How to rest? What is the best Rest Strategy? Here is a surprise- we need TWO REST STRATEGIES, how to rest before and how to rest after exercise. If you have back issues warming up and getting the body ready for exercise is VERY important. After exercise, we need to “cool down” which aids our bodies in the recovery process. Low angle inversion on a Gravity Pal is a great rest strategy that you can do before, in preparation for exercise, and after, as part of your exercise recovery program. Listening to music and is great for my soul but what is the best kind of rest for my back? After all, I want my back to recover and get stronger. I look for things that will allow me to obtain quality rest in the shortest possible time frame. That was a big reason I developed the Gravity Pal LOW Angle Inversion Table as part of my own self care program. Gravity Pal allows the tissues to immediately release and the fluids of the body to thoroughly circulate – while I simply relax. 2. Conveniently fits into my schedule. A valuable self-care strategy for dealing with back pain requires both: effective exercise that you will do and effective rest and recovery – so we can get on with life and living. Read more about how Gravity Pal can help here.